Kadapa, a place normally associated with faction fights, bombs and violence. Thanks to countless Telugu films, Kadapa has come to mean, fierce looking, scowling factionists, who hurl bombs, kill people without batting an eyelid and eat red hot chillies for fun. While the factional rivalry is true to an extent, what is shown in Telugu cinema, is more or less a stereotype like anything else. There is more to Kadapa than just scowling factionists or bombs or faction fights. For starters it was the birth place of Tallapaka Annamayya who composed all those wonderful keertanas in tribute to Lord Venkateswara. Pothuluri Veerabrahmendra Swamy, who predicted the future and was known for his prophecies. The poetess Molla, born into a potter’s caste, and who wrote the Ramayana in Telugu. B.Nagi Reddy who along with Chakrapani, set up the Vijaya Vauhini Studios in Chennai, that produced such memorable classics like Mayabazaar, Patala Bhairavi, Missamma and awarded the Dada Saheb Phalke Award too. The veteran Telugu cinema comedian Padmanabham hailed from here, as did another veteran actress Santhakumari. B.N.Reddy director of such classics of Telugu cinema like Malliswari, Bangaru Papa, Raja Makutam too came from this place. Dr.Y.V.Reddy, who served as director of RBI and C.P.Brown who compiled the first English-Telugu dictionary too were from Kadapa. With the Andhra Pradesh Government, deciding to hold the Sri Rama Navami Utsavam at Vontimitta in Kadapa district, the place has again come into prominence. Traditionally the Sri Rama Navami Utsavam was held at the famous Bhadrachalam temple, in erstwhile united Andhra Pradesh. With Bhadrachalam now being a part of the new state of Telangana, the AP State Govt has decided to conduct the Sri Rama Navami Utsavam at the Vontimitta Sri Kodanda Rama Swamy Temple. Kadapa district gets it’s name from the Telugu word for threshold(Gadapa), as it was considered the starting point to the Tirumala temple, from the western part. There is a Devuni Kadapa in Kadapa city, which is believed to be the starting point of the pilgrimage to Tirumala. Pilgrims going to Tirumala would first have the darshan of Lord Venkateswara here, and then proceed further. Kadapa also contains the famous Gandikota Fort, which was the citadel of the Pemmasani Nayakas, who served the Vijayanagara Empire, and were known for their bravery and military prowess. Vontimitta falls on the Chennai-Mumbai line, and is close to both Kadapa(25 Km) as well as Rajampet. The place is believed to have got it’s name from Vontudu and Mittudu, two robbers who reformed and later turned into devoteess of Lord Rama. The temple here was believed to have been built by these two, after which they turned into stone. The idol here was believed to have been installed by Jambavantha, the bear king who helped Lord Ram in his mission to Lanka. 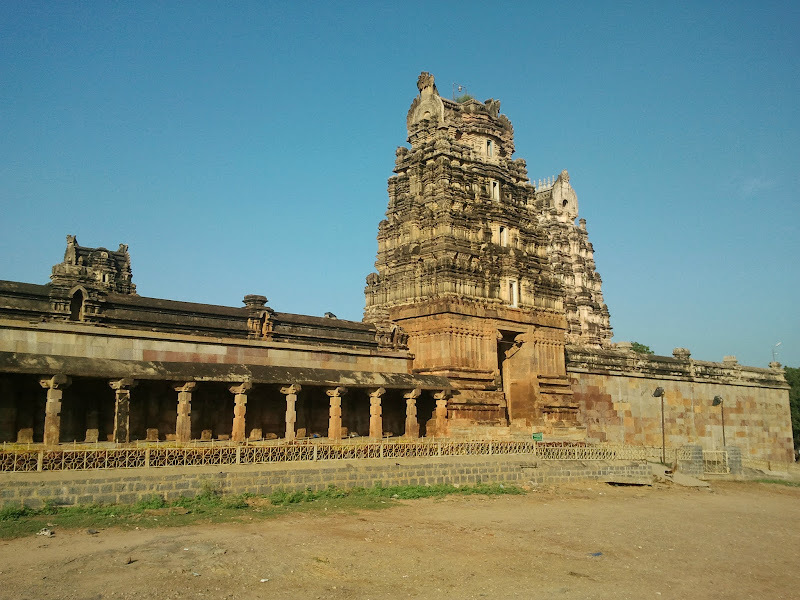 Historically speaking, the Vontimitta Temple was built somewhere around the 16th century as per records, first by the Chola rulers, and later the Vijayanagar rulers. Bammera Pothana, the great Telugu poet, who wrote the Andhra Maha Bhagavatamu dedicated his magnum opus to Lord Rama at this temple. As did Annamayya, who visited this temple frequently and also composed many keertanas( hymns) in praise of Lord Rama. Jean Baptiste Tavernier, the famous French traveller also visited this temple in 1652 and described it as one of the most beautiful in India. Though the Cholas started the construction of the temple, the architecture here is more or less in the traditional Vijayanagara style of a Sandhara order, which has a rectangular yard enclosed by walls. The temple itself is known for it’s architectural elegance, having 3 ornate Gopurams, one facing east, which is the entrance to the temple, the other 2 facing north and south. The central tower is built in 5 tiers and you have steps to approach this. The Mandapam or the Rangamantapam,essentially an open air theater sorts has over 32 pillars, and is known for it’s exquisite sculptures, also called the Madhyarangamandapam. It has wonderful carvings of apsaras, Krishna, Vishnu. The corner columns have 3 layers carved with images of apsaras, and the roof of the mandapam, has many decorative brackets. 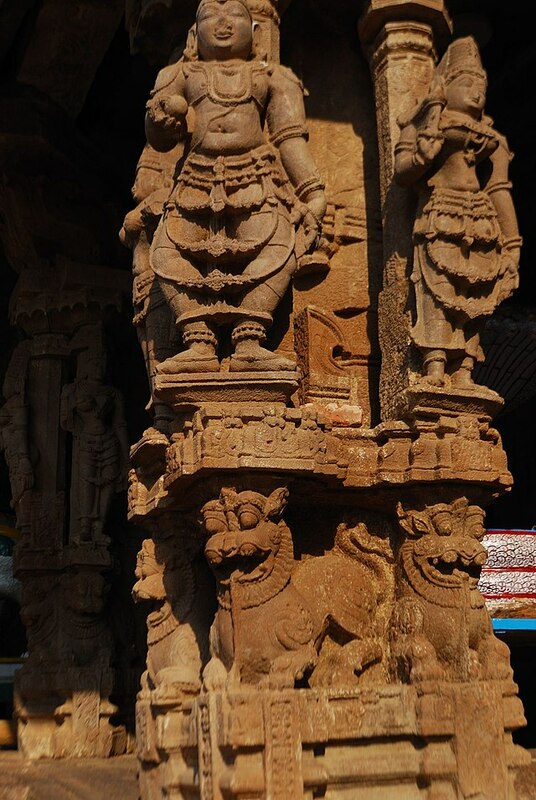 Rama and Laxmana also have their sculptures in the mandapa here, Ram is depicted in a standing position with bow in right hand, arrow in left hand, hence the name Kodanda Rama, while Laxmana is depicted in the tribhanga posture with his right hand free, while the left hand holds a bow. You also have sculptures of Krishna in a dvibhanga posture, with left leg on ground and right leg, bent at knee, crossed over the left, as well as that lifting Govardhana hill. The sanctum sanctorm is approached by an inner chamber called the antarala, and here you have the idols of Ram, Sita and Laxman all carved out of one single block of stone. Hanuman who is usually represented in most Ram, Sita and Laxman temples as along with the 3 main deities is however missing, and has a separate temple for him here though. 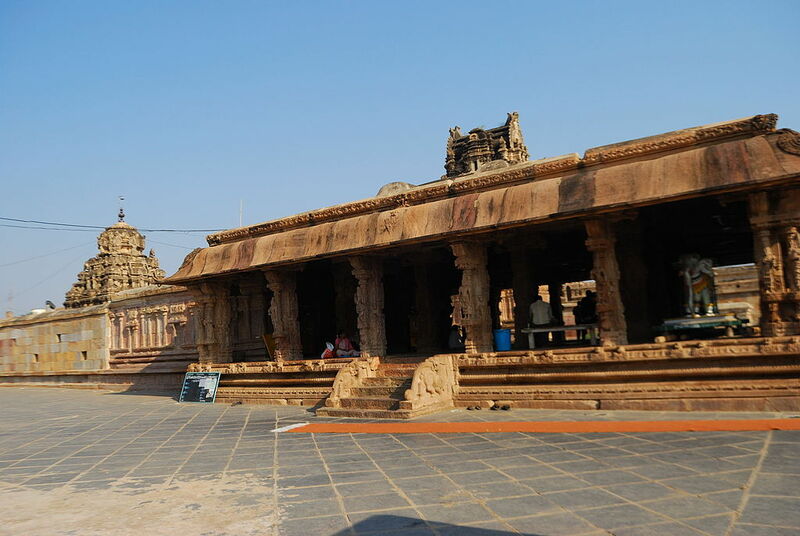 Apart from the religious significance of Vontimitta, it is also a place that has a lot of history attached to it, dating right back to the Vijayanagara era, and for that alone it needs to be visited, as well as the awesome architecture. 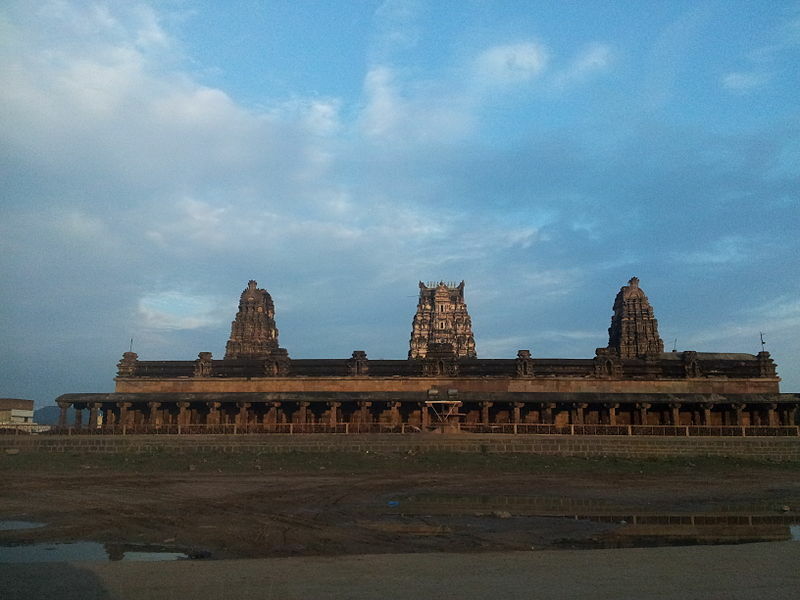 This entry was posted in Andhra Pradesh, Kadapa, Vontimitta and tagged Kadapa, Vijayanagara Empire, Vontimitta. Bookmark the permalink. Really liked your post about Kadapa. During 2008 to 2010, I went to Kadapa a number of times, and knew it only as a hotbed of sectarian violence. Never did I come to know of the famous temples of this town . This shows the lack of knowledge , most of us have about places , other than the ones, away from international tourist circuit. Two, it also shows the utter failure of successive governments in Andhra, to not think beyond Hyderabad and Tirupati Devsthanam and fail to promote lesser known tourist places to people from outside the state.